Stewart Craig Miller, a native of Lafayette, Indiana, studied Biology at Ball State University receiving a B.S. in Education in 1968. As an avid morel mushroom hunter from childhood he began his research in 1972 while teaching Biology at Marion High School in Marion, Indiana. Having access to laboratory equipment he studied morel spores on various forms of culture medium under the microscope initiating a lifelong obsession to solve the morel life cycle mystery. In May of 1992, twenty years later, Stewart wrote in his journal, “Without a doubt the mycorrhiza is the answer to this 200 year old mystery. It’s a simple symbiotic pact between the fungus and the tree,….” It took another ten years to prove that his theory was correct. The first goal was to photograph a morel hyphae hatching from a single morel spore and entering the root of a tree. This was an enormous task and it took ten years of testing to find a staining technique, and a high tech microscopic camera with the proper filtering to get the job done. 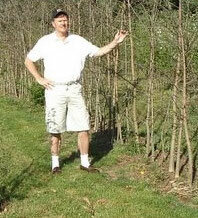 The second goal was to inoculate various trees with the morel fungus in an attempt to propagate morel mushrooms. 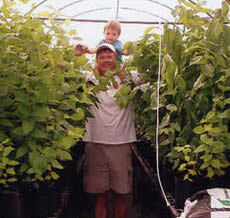 Stewart began inoculating elm tree seedlings in June of 1992, and it took another seven years of testing and retesting to successfully cultivate morels. In February of 2002, Stewart began preparing his patent application and detailed patent search. The patent search revealed that nothing had ever been written describing the morel fungus as being mutualistic, symbiotic, mycorrhizal or endomycorrhizal. Stewart Miller was the first to discover the secret of the symbiotic, mycorrhizal relationship of the morel fungus with trees and plants, solving the 200-year-old mystery.